When listening to the new Vesperian Sorrow record, I get this very conflicting feeling: everything tells you there’s nothing special about that one, that you've heard a lot of such records, that you’ll never remember it in a few months. However, playing it loud is such a freakin' pleasure! 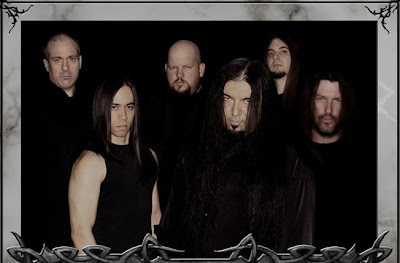 The thing is, Vesperian Sorrow is not just another symphonic black metal band. The guys have been around for 15 years now, with an amazing consistency in terms of quality. These veterans from Texas-USA sure know what kind of music they want to play, and they do it perfectly well; even if it means they have to do almost everything on their own (the record is however released by The Path Less Travelled Records). 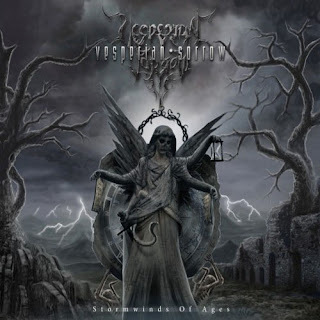 But Vesperian Sorrow have not given up; and they keep on producing that awesome Sympho-Black Metal they love, with a quality close to perfection. As I was just saying, there is nothing really special on this one, although there are some cool and original elements here and there, like that acoustic moment on “Crown Of Glass” and the nice clean vocals on "Eye Of The Clocktower”. I also enjoy very much the global “gothic feeling” on the record, nothing too cheesy, just a permanent dark and gloomy atmosphere. The job on the guitars is tremendous, with a bunch of killer riffs, fast, melodic and slow, and also many solos. The balance between the orchestrations and guitars -which is usually the key on such records- is totally mastered on Stormwinds Of Ages. Did I mention that the band has a nice guest-list featured on those new songs? Among them Jason McMaster (former Watchtower), Carl August Tidemann (Winds, Arcturus) and Erica Tandy (Autumn Tears). Another proof that this band like to do it perfectly right! This a new very fine piece of Sympho-Black Metal, perfectly produced and composed, with dynamic, symphonic and catchy songs. There is absolutely nothing wrong on this record, only around 60 minutes of big, fat, heavy music that will fill you with pleasure if you enjoy this specific genre. Sometimes it’s just nice to quit listening to all the new & hype stuff and get back to basics. Vesperian Sorrow is a very serious band, extremely committed to the art they enjoy and I must say they did another great piece of work with this new record. Fans of Sympho-Black Metal absolutely need to check this one out, and fans of black metal in general should give it a try!